Florida school shooter Nikolas Cruz was a deeply troubled 'loner' who was expelled last year for 'fighting over his ex-girlfriend' and made shocking Instagram posts detailing a twisted obsession for guns, violence and hurting animals, it has emerged. Nikolas Cruz shot 17 people dead when he went on the rampage at Marjory Stoneman Douglas High School in Parkland on Wednesday wearing a gas mask and spraying bullets from an AR-15 assault rifle he was able to buy legally. Details have already began to emerge about the shooter, who owned the AR-15 rifle, had a troubled past and recently suffered the loss of his adoptive mother. Former classmates of the 19-year-old, who was charged this morning with 17 counts of premeditated murder, said they had feared he was capable of a school shooting as they revealed he was 'crazy about guns'. Students said Cruz was expelled after a fight with his ex-girlfriend's new boyfriend. The gunman had also been abusive to his girlfriend, the student said, while a teacher said the teenager once become obsessed with a girl to the point of 'stalking her'. Cruz's Instagram is filled with disturbing posts of what appears to be himself with his face covered showing off a terrifying arsenal of weapons. Sheriff Israel reported that some of things the shooter had been posting was 'very disturbing'. In one Instragram post, Cruz posted a screengrab of Google search results for 'what does allahu akbar' mean. Allahu Akbar means 'God is great' in Arabic, and is something Islamist terrorist often shout before attacks. Students who say they knew Cruz, claimed he liked to kill animals and was also racist. 'He was crazy because he liked to kill small things, like little animals - frogs and other animals like that and he just had a crazy mind. He was racist and he was just crazy,' one told 10ABC News. They added that he was a volatile teenager whose strange behavior had caused others to end friendships with him. 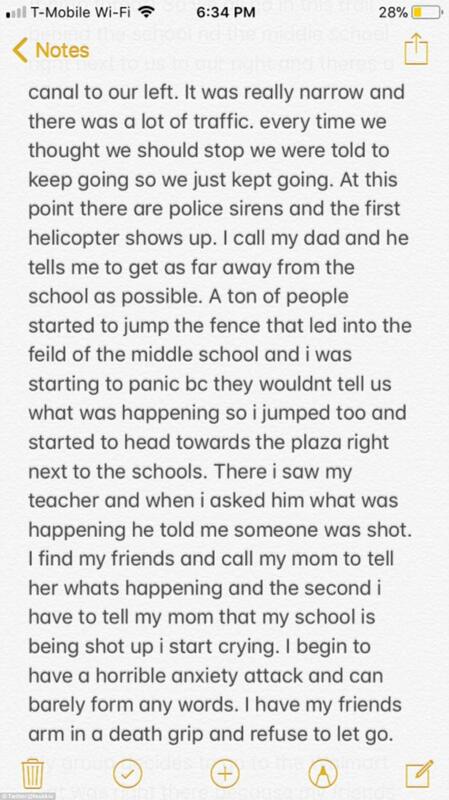 Cruz is believed to have set off the fire alarms to draw people out into the halls shortly after 2pm before he opened fire - and then managed to evade police by pretending to be one of the terrified students running for cover. The shooter was armed with at least one AR-15 rifle, had 'multiple magazines' and smoke grenades when he stormed the school wearing a gas mask and killed 17 students and staff. 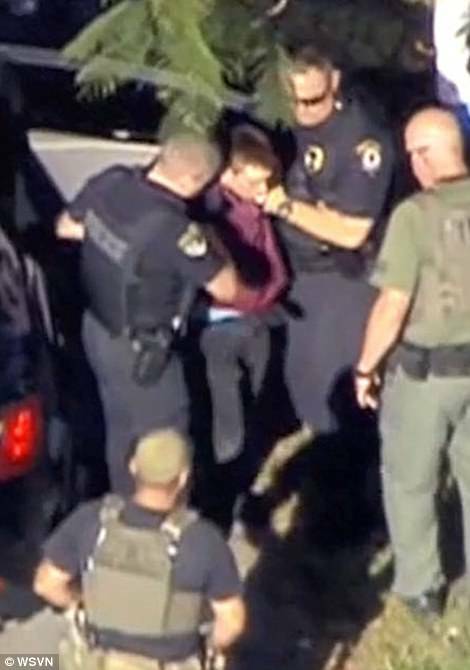 He was taken into custody off the school campus about an hour after the shooting broke out. This morning, the orphaned teenager was charged with 17 counts of premeditated murder after being questioned for hours by state and federal authorities following the deadliest school shooting in the US in five years. Authorities were contacted with concerns about Cruz five months ago. Ben Bennight says he alerted the FBI to a comment shared by Cruz on one of his YouTube videos back in September. He says the FBI was quick to respond to the concerning statement, arriving at his office the very next day to find out if he knew anything about the young man. That was after he called a local field agent, revealing that his initial attempts to send in a screengrab of the comment failed when the email address he found listed on the federal agency's website came back with a domain error saying that it did not exist. 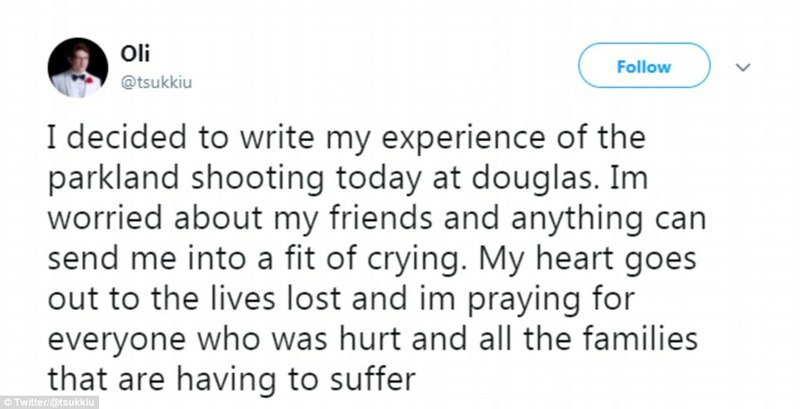 He didn't get a follow up from the FBI until Wednesday though, after the shooting. At a press conference Thursday morning, an FBI officials said they followed up on the report but were 'unable to further identify the person who made the comment'. Broward County Mayor Beam Furr also revealed that Cruz had been getting treatment at a mental health clinic for a while, but hadn't been back to the clinic in more than a year. 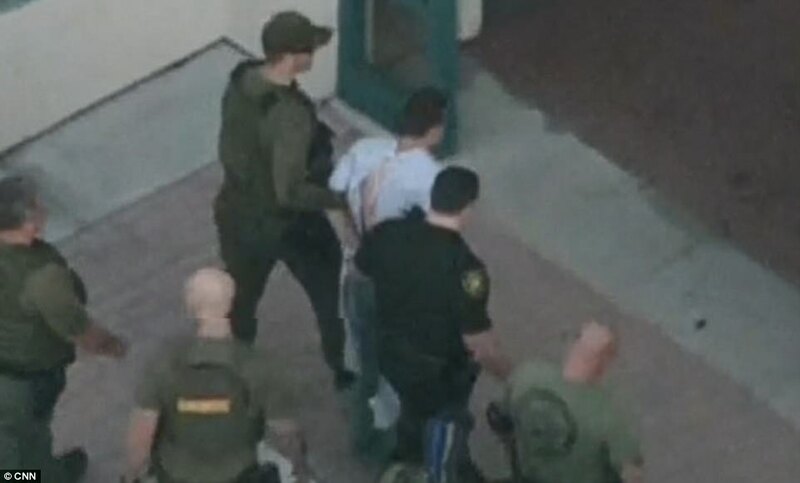 Authorities offered no immediate details about Cruz or his possible motive, except to say that he had been kicked out of the high school, Marjory Stoneman Douglas High School, which has about 3,000 students. He had also only recently lost his adoptive mother. Cruz's mother Lynda Cruz died of pneumonia on November 1 neighbors, friends and family members said, according to the Sun Sentinel . Cruz and her husband, who died of a heart attack several years ago, adopted Nikolas and his biological brother, Zachary, after the couple moved from Long Island in New York to Broward County. Nikolas was an infant when he was adopted, and his adoptive mother was allegedly the only person he was close with. While his brother was quiet and liked to stay indoors, Nikolas constantly got into trouble and appeared to have 'emotional issues'. Neighbors told the Sun Sentinel that the police were called several times to deal with Nikolas. The boys were left in the care of a family friend after their mother died, Kumbatovich said. Friend and neighbors of the family say they saw Cruz attempting to kill or torture animals on a number of occasions. Shelby Speno witnessed Cruz shooting at chickens owned by another resident, while Malcolm Roxburgh said the teen disliked pigs kept by another family and 'sent over his dog...to try to attack them'. It has emerged that the teenager had been banned from carrying a backpack on campus prior to being expelled and had already been identified as a potential threat to students long before the deadly rampage. Student Adam Habona, who lived next door to Cruz for six months described him as a violent loner who stole from neighbors and hurled coconuts at their homes. Habona told Sun Online he believed the suspect had racist and extreme political views and said Cruz once smashed a security glass of a classroom door before he was expelled. 'One time he stole something out of neighbor's garage another time he was throwing coconuts at the neighbour's houses. He was not a good kid,' he said. Jillian Davis, 19, said she was in a school Junior Reserve Officer Training Corps with Cruz in the 9th grade. She remembered him as a quiet and shy young man who would almost change personality when angry. He talked a lot about guns and knives but no one took him seriously, she told Reuters. 'I would say he was not the most normal or sane kid in JROTC. He definitely had a little something off about him. He was a little extra quirky,' said Davis, who graduated from the school last year. 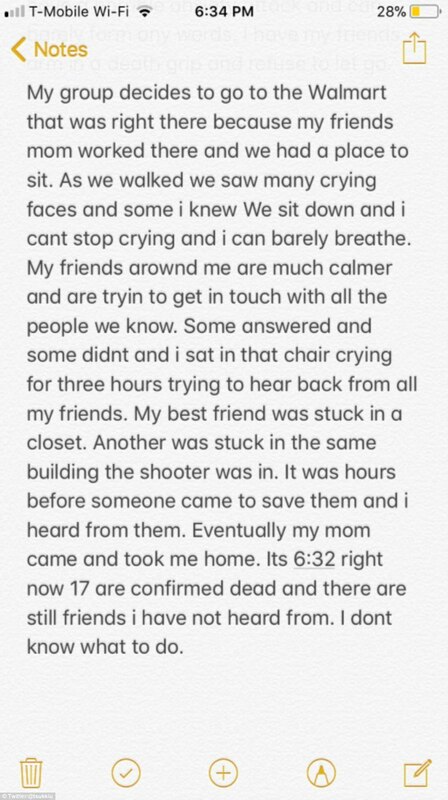 Matthew Walker, a 17-year-old student at the school, told WFOR-TV that all his classmates 'knew it was going to be him'. Victoria Olvera, a 17-year-old junior at the school, said Cruz was expelled last school year because he got into a fight with his ex-girlfriend's new boyfriend. She said he had been abusive to his girlfriend. Another student said that part of the reason Cruz was expelled was that he was caught carrying bullets in his backpack. 'I think everyone had in their minds if anybody was going to do it, it was going to be him,' she said. President Donald Trump said in a Tweet this morning that Cruz appeared to be 'mentally disturbed'. He had earlier offered sympathy and said he spoke with Florida's governor, but he has not addressed the nation. Trump has cited mental health before as a cause for mass shootings, dismissing questions about gun control. After Cruz's mother died, he and his brother were left in the care of family friend Barbara Kumbatovich, of Long Island, said. Unhappy there, Cruz asked to move in with a former classmate from Stoneman Douglas, in a mobile home park in northwest Broward. The family agreed and Cruz moved into his own room in the home around Thanksgiving. 'The family brought him into their home,' said Jim Lewis, an attorney representing the family who took in Cruz, adding that it 'wasn't working out' at his family friend's in Lake Worth, Palm Beach. Cruz brought his AR-15 with him to the family's home, where it was kept in a locked cabinet that the teen had a key to. Sources told CNN that the gunman purchased the rifle in the past year and passed a required background check to obtain it. Federal law allows people 18 and over to legally purchase long guns. At 21, people can legally buy handguns from a licensed dealer. While living with the family, Lewis started going to a school for at-risk youth. Usually every morning, the father of the family would drive Cruz to school, but on Wednesday he overslept and then gave a cryptic reason why. 'He said, 'It's Valentine's Day and I don't go to school on Valentine's Day,'' Lewis said. Lewis said the family is devastated and didn't see this coming. They are cooperating with authorities, he said. The family's cream-colored home was empty Thursday morning but in the backyard a bullet-riddled Bud Light can was stuck on a twig of an avocado tree overlooking a creek. Broward County Mayor Beam Furr confirmed during an interview with CNN that the shooter was getting treatment at a mental health clinic for a while, but that he hadn't been back to the clinic for more than a year. 'It wasn't like there wasn't concern for him,' Furr said. 'We try to keep our eyes out on those kids who aren't connected ... Most teachers try to steer them toward some kind of connections. ... In this case, we didn't find a way to connect with this kid,' Furr said. 'And some of the things that have come to mind are very, very disturbing,' he added without elaborating. 'He was that weird kid that you see ... like a loner,' he added. 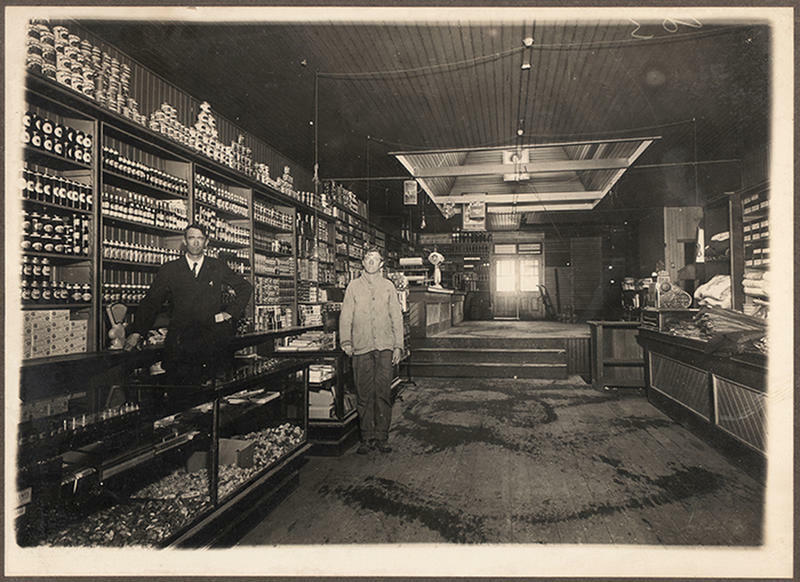 'He started progressively getting a little more weird,' Mutchler said. 'He started going after one of my friends, threatening her, and I cut him off from there,' Mutchler said. 'I think everyone had in their minds if anybody was going to do it, it was going to be him,' Mutchler said. He said that he had been told by several students that Mr. Cruz was obsessed with a girl at the school to the point of 'stalking her'. 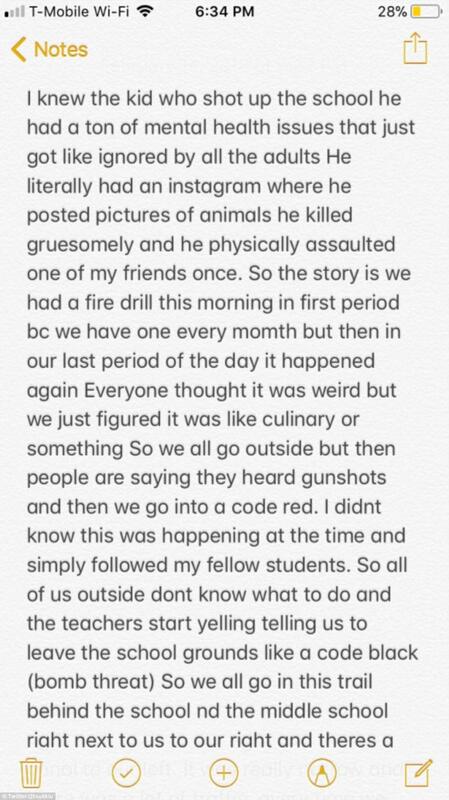 Another student named Oli took to Twitter to share a lengthy post about knowing Cruz and the harrowing experience of the shooting incident itself. 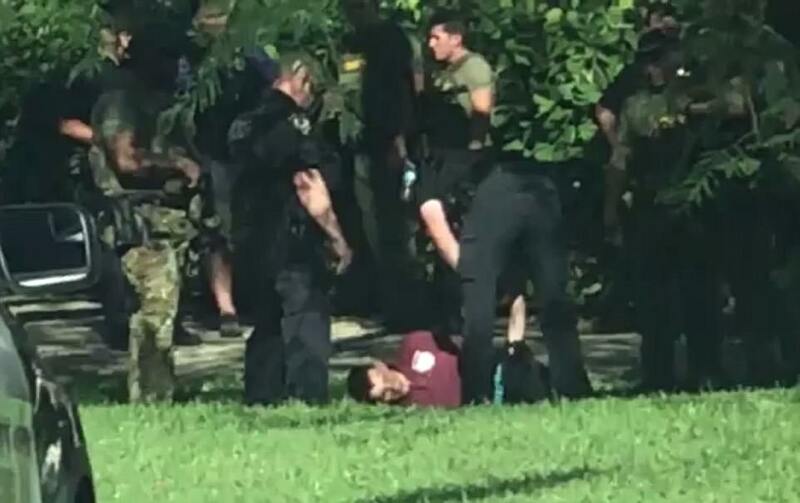 Another student, who was not identified, but claims to know Cruz told WSVN he was obsessed with guns and showed him pictures of them on his phone. He added that Cruz made him nervous. Former classmate Joshua Charo, 16, told the Miami Herald that all Cruz 'would talk about is guns, knives and hunting'. 'I can't say I was shocked. From past experiences, he seemed like the kind of kid who would do something like this,' Charo said. 'He used to tell me he would shoot rats with his BB gun and he wanted this kind of gun, and how he liked to always shoot for practice,' Charo added. One student added that Cruz started selling knives out of a lunchbox when he started high school. As a high school freshman, Cruz was part of the US military-sponsored Junior Reserve Officers' Training Corp program at the school. 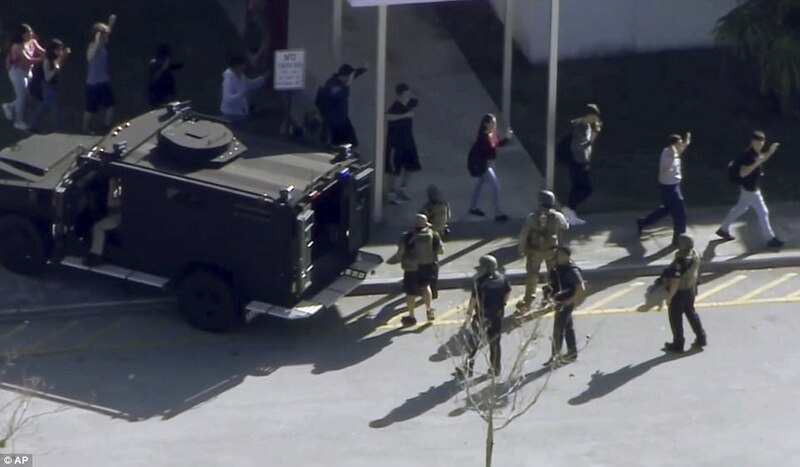 Cruz, equipped with a gas mask, smoke grenades and multiple magazines of ammunition, and armed with at least one AR-15 rifle, stormed the school yesterday, killing 17 and injuring at least 20, according to the sheriff. Police said he started firing before he entered the school building and left behind a deadly trail. Twelve of the people shot dead were found dead inside the school building, two more were killed just outside the school and another in a nearby street. Two other people died later after being rushed to hospital. Police arrived at the scene to find hundreds of students fleeing the school. 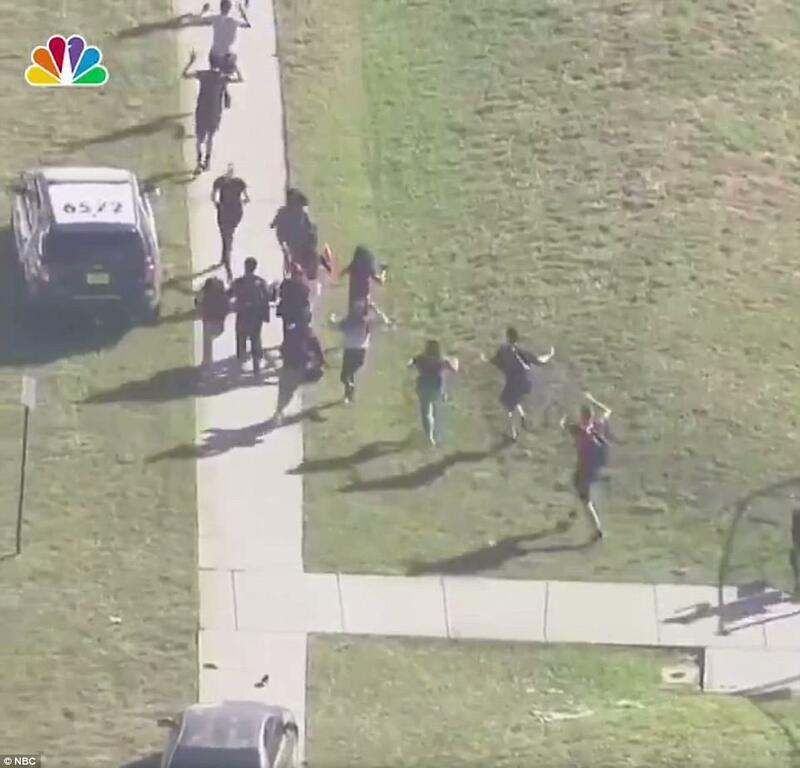 They later learned the shooter had concealed himself in the crowd and was among those running off the campus. Investigators were able to identify him after trawling surveillance video. He was arrested about and hour after the shooting first broke out when police cornered him in a nearby neighborhood. He now faces multiple murder charges.